Round 2 has come and gone and the 2019 NRL season is well and truly in full swing. The second weekend of NRL action reaffirmed some of the trends that emerged from Round 1, with South Sydney, Melbourne and the Wests Tigers continuing their winning ways, while pressure mounts on sides that are yet to get off the mark this season, namely the Bulldogs, Dragons, Titans and Sea Eagles. We also witnessed some players separate themselves from the pack throughout an exciting weekend of football, such as the promising debut of young Rooster Lachlan Lam and a dominant display from Tevita Pangai Jr against his Tongan counterpart Jason Taumalolo. With the dust settled on the second round of the competition, let’s take a look at the key takeaways from this weekend. It was glaringly evident during the Dragons’ loss to the Rabbitohs on Thursday night that they are sorely missing star lock forward Jack de Belin. Compounded by the loss of Tyson Frizell to injury, the understrength Dragons forwards struggled to contain the size and momentum of the rampant South Sydney pack in the second half, despite some valiant efforts from young tearaway Blake Lawrie and a rampaging Tariq Sims. The Dragons started the game with plenty of aggression and energy in the middle of the park as they earned ascendancy in the first half, however, they could not sustain it across the entire eighty minutes, largely due to the absence of the defensive work rate, line speed and tenacity of de Belin. 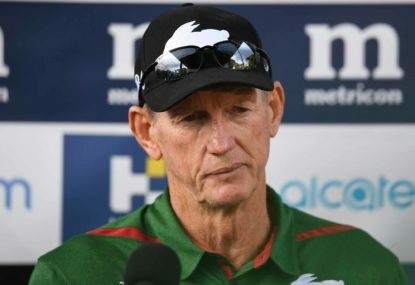 This qualities which will be near impossible to replace and Round 2 highlighted that his loss is set to have a significant impact on the Dragons’ fortunes this season. As impressive as Craig Bellamy’s men have been in the opening fortnight on the competition, they are far from invincible. While the dazzling early season form Jahrome Hughes and Brodie Croft has shown plenty of promise moving forward in the ‘post-big three era’, they seemed to be lacking the ruthlessness and consistency synonymous with Melbourne Storm teams of the past. Despite boasting periods of dominance throughout their opening two games and establishing early leads, they have invited their opposition back into the game on both occasions, rather than tightening their stranglehold built upon discipline and composure that they have become renowned for over the past decade. Errors, ill-discipline and some underwhelming goal-line defence allowed the Raiders to remain in the game and post two tries in the space of fifteen minutes in the second half, as they did against Brisbane in the opening round. 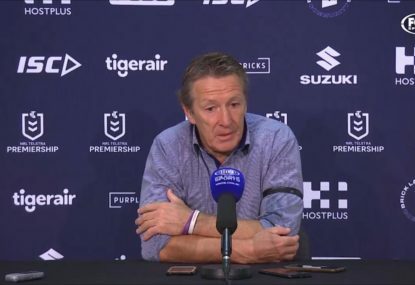 While Melbourne have been a standout side to start the new season and will no doubt feature deep into September once again, they may have shown a slight hint of vulnerability that could become telling at the business end of the season. Jai Arrow is the man to lead the Gold Coast Titans out of the NRL wilderness. He earned himself plenty of admirers in his wholehearted performance in a well-beaten side against the Sharks on Saturday. The Titans lock forward ran for a staggering 290 metres along with his usual mountain of tackles. Despite his relatively small stature for a middle forward in the NRL, the Queensland Origin star has always been a dominant presence in the Titans pack since his arrival from Brisbane last season and is one of the most consistent players in the competition. 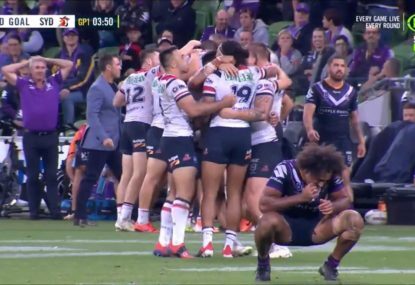 Even after his incredible individual performance, Arrow’s reaction of devastation once the final whistle blew on his team’s second loss of the season highlighted just how much he cares about his club. 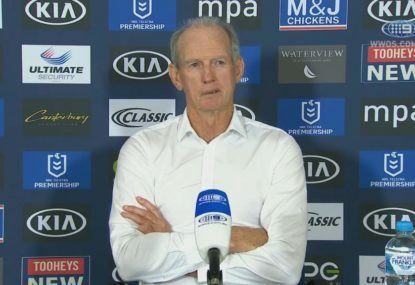 While they do boast some strong leaders such as Ryan James, being a new franchise in the NRL without a rich history behind them the Titans are a club that have struggled for a clear identity and strong leadership after some short-sighted recruitment decisions, poor on-field results and a dwindling fan-base. However, along with the involvement of Mal Meninga at the club, Jai Arrow can be the cornerstone of a rugby league resurgence on the glitter strip. His consistent effort and dedication towards in his performance and his genuine pride he showcases in the jersey he represents presents a strong leader around which the Titans can build a strong club culture for years to come. While it is still very early days in the 2019 season, the decision makers in the Eels’ football department deserve a pat on the back. The new recruits in the blue and gold have made a stark difference to Parramatta’s form in their opening two games after a disastrous 2018 campaign, in particular, a rampaging Blake Ferguson on the right wing. The former Rooster was instrumental in the Eels’ dominance over the Bulldogs on Sunday. 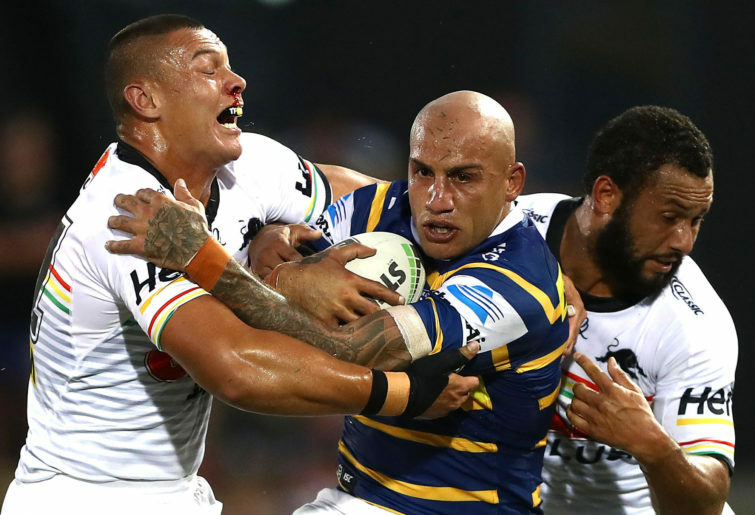 Ferguson ran for 298 metres and scored two tries, while starting his team’s attacking sets on the front foot with strong yardage and aggressive carries from the backfield, filling the void left by former Parramatta fan-favourite Semi Radradra. Ferguson’s natural swagger and flamboyance has also brought an air of confidence to Brad Arthur’s young side, which was desperately needed after their wooden spoon season last year. While Ferguson has attracted some well-deserved accolades for his impressive start to the season, former Manly back-rower and fellow new recruit Shaun Lane has been just as pivotal in the Eels’ impressive start to the season. He has been a constant attacking threat on the left edge, running for a whopping 167 metres while nabbing a try of his own in Round 2. Lane has added some much-needed size to the Eels’ forward pack, as well as an extra dimension to their attack, showcasing his strong line running and some subtle ball-playing ability on the edge of the ruck, taking pressure off his halves, in particular, rookie five-eighth Dylan Brown. These seemingly smart recruitment decisions could lead Parramatta out of the cellar in 2019. In the absence of Cooper Cronk against Manly in torrential rain on Saturday night, Luke Keary reminded everyone of his grand final heroics of 2018. The incumbent Australian five-eight grabbed the game by the scruff of the neck, steering his side to victory despite the Roosters missing key playmakers in Cronk as well as co-captain Jake Friend. The former Rabbitoh had a hand in several tries and exercised control over the game with a strong kicking and strong decision making in an unsettled spine. This game-management and composure have been elements of Keary’s game that have developed significantly since the arrival of Cooper Cronk in Bondi and looks set to blossom even further in 2019. 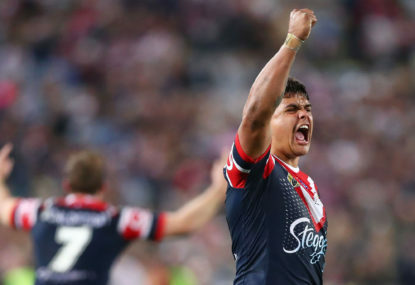 With State of Origin honours knocking on Keary’s door while playing behind one of the strongest rosters in the competition, his Round 2 performance proved he could establish himself as on the of the NRL’s elite halves this season.